Superheroes can usually beat any obstacle with the help of their massive strength and superior weapons, but there’s a new problem on the horizon that none of them can seem to overcome: outsourcing. 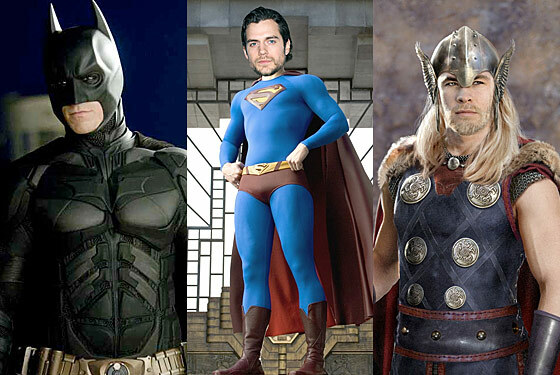 This week’s announcement that British actor Henry Cavill would play the title role in Zack Snyder’s Superman is only the latest example; he joins the Welsh Christian Bale (as Batman), British-raised Andrew Garfield (as Spider-Man), Australian Chris Hemsworth (as Thor), and even Canadian Ryan Reynolds (as Green Lantern) as foreigners cast who’ve been cast as classic, American-identified superheroes. Only Chris Evans in the upcoming Captain America bucks that trend, but even that casting race came with unusual stipulations — the role was restricted only to American actors (which hindered Romanian-born Sebastian Stan, the actor who got the runner-up prize of the hero’s sidekick), and even then, the production came up blank after months of casting and had to extend a last-minute offer to the reluctant Evans. What’s to blame for the domestic superhero shortage? Vulture asked industry professionals for their takes on the situation. The ugly truth is that American leading men just aren’t terribly manly anymore, says John Papsidera, the casting director on both The Dark Knight and The Dark Knight Rises. Of course, Papsidera acknowledges are other reasons for the decline of the American-as-superhero: Cable TV networks have defined themselves by high-quality series like Mad Men and True Blood that have taken many potential American leading men off the spandex-suit market, including actors like Joe Manganiello and Matthew Bomer, who were mentioned for Superman but already had series commitments. And having spent billions to acquire the rights to all these comic-book superheroes, Hollywood’s studios are eschewing many of those American leading men precisely because they’re too closely associated with those highly recognized American television roles. As Louise Ward, an agent at United Talent who represents young leading men like Channing Tatum explains, “The studios are highly invested in these superheroes as brands. As such, they don’t usually want [an actor with] the baggage of another role, and they often can’t have an affiliation with another role.” Papsidera echoes this: “Kids are not so easily fooled anymore. They’ll say, ‘Oh, it’s that guy from Gossip Girl!’ or ‘It’s the girl from The O.C. !’” But he thinks there’s a larger problem at work here. Papsidera says he’s had to turn to Canada, Australia, and the U.K. to fill our growing superhero testosterone gap. One leading talent agent agrees that American leading men are increasingly less than hypermasculine, but thinks that Papsidera may have it backwards: It’s not that American men aren’t allowed to act manly; it’s that manly American men aren’t allowed to act. So we’re full circle: These superhero-eligible foreigners have the immigrant work ethic. What’s more American than that?